Relations between India and Pakistan have taken a cautious step forward, with the two sides deciding to establish a religious corridor that connects Punjab in India with a key Sikh gurdwara, or temple, across the border. The move comes with a proposal to offer visa-free access for Indian pilgrims to the temple. 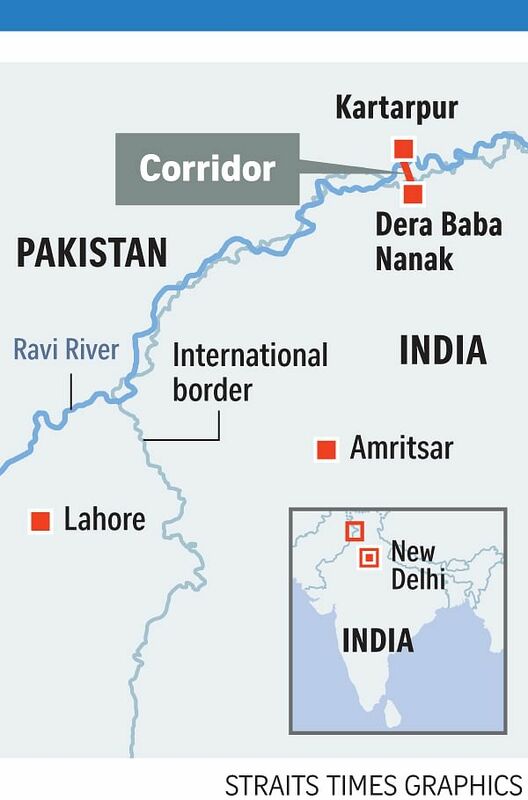 Indian Vice-President Venkaiah Naidu on Monday laid the foundation stone for the corridor that connects Dera Baba Nanak in Punjab to the international border. Today, Pakistani Prime Minister Imran Khan will mark the start of the corridor's establishment on its side of the border up to the Gurdwara Darbar Sahib in Kartarpur. Sikhism's founder Guru Nanak spent his last 18 years in Kartarpur. The gurdwara was built in his honour after he died there in 1539. Some of Sikhism's important shrines are located in Pakistan and continue to be visited by thousands of pilgrims from India each year. They have long complained of harassment because of complex visa regulations and other logistical hurdles. The corridor to Kartarpur, meant to ease this process, is a demand that has been around for more than two decades. Its acceptance now is being viewed as a sign of progress, even as old concerns, particularly on terrorism, continue to bedevil ties between the two South Asian neighbours. The ceremony to lay the foundation stone in India was, in fact, held on a day that marked the 10th anniversary of the November 2008 attack in Mumbai by Pakistan-based terrorists. India on Monday used the occasion to accuse Pakistan of showing "little sincerity in bringing (the) perpetrators to justice" and urged it to "give up double standards and to expeditiously bring the perpetrators of the horrific attack to justice". Punjab Chief Minister Amarinder Singh, a leader of the opposition Congress party, even shunned an invitation from Mr Khan to attend the ground-breaking ceremony in Pakistan. Captain Singh tweeted that despite his dream to visit the Kartarpur gurdwara, he "cannot go while killings of Indian soldiers and terror attacks in Punjab continue". Three people were killed in a grenade attack on a prayer hall near Amritsar on Nov 18 which Capt Singh blamed on Pakistan. Dr T.C.A. Raghavan, a former Indian high commissioner to Pakistan and the current director-general of the Indian Council of World Affairs, described the move to establish a religious corridor as an initial positive step. "Given that nothing much was happening otherwise, it shows that India-Pakistan ties can move forward in unexpected ways, but I would not build a larger edifice out of this at this stage," he told The Straits Times. "Given the history of our bilateral ties, it is best to be cautious, but each step forward is an important one," Dr Raghavan added. The decision to build the corridor, which Prime Minister Narendra Modi has compared to the fall of the Berlin Wall, comes after India cancelled a meeting between its External Affairs Minister Sushma Swaraj and her Pakistani counterpart in September after three policemen were killed in Jammu and Kashmir, an act blamed on "Pakistan-based entities". Ms Swaraj also refused an invitation from Pakistan to attend the corridor's ground-breaking ceremony, citing prior commitments. India has instead deputed two other ministers to attend the event. With a length of around 4km, the road corridor will help pilgrims avoid a circuitous route via Lahore, which is located around 120km from Kartarpur. The goal is for Indian pilgrims to be able to visit the gurdwara in Kartarpur using this corridor by next November, which is when Guru Nanak's 550th birth anniversary will be commemorated. The corridor proposal regained prominence after Punjab minister and former Indian cricketer Navjot Singh Sidhu attended Mr Khan's swearing-in ceremony in August, where he met the Pakistani chief of army, General Qamar Javed Bajwa. Mr Sidhu returned to quote the general as saying he was keen on opening the corridor. It has, however, generated concerns from some in India, including those in the security establishment. Punjab witnessed a bloody bout of secessionist violence, especially in the 1970s and early 80s, which was blamed on support from Pakistan. "Over the last three or four years at least, there have been concerted efforts by Pakistanis to light the fires in Punjab once again," Mr Sushant Sareen, a senior fellow at think-tank Observer Research Foundation, told The Straits Times. He said that India, by going ahead with the corridor at this stage, has decided to "walk into a trap" despite "tell-tale signs" of the secessionist movement again gaining "some traction". Monitoring an increased flow of pilgrims and their activities in Pakistan, Mr Sareen argued, will be difficult. "If security-related problems emerge tomorrow, will we close it down?" he said.